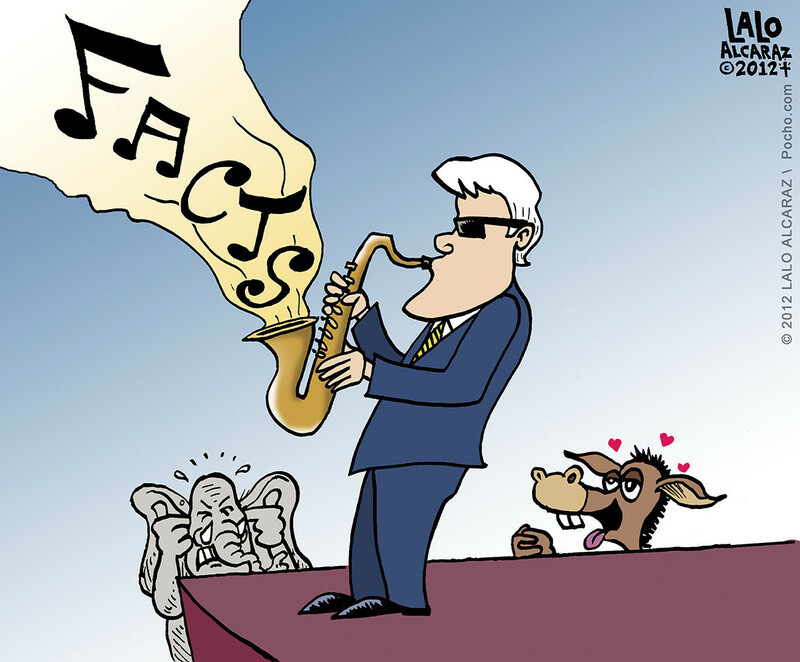 Bill Clinton strolled onto the DNC stage for last night's keynote speech and spoke some beautiful music to Democrat ears, riffing off-script, leading the crowd through a melody of policy, arithmetic, reason and rhetoric. Our favorite Chicano political satirist Lalo Alcaraz summed it up beautifully in today's cartoon. Scroll down to see more examples of Lalo Alcaraz's work. Lalo Alcaraz is perhaps the most prolific Chicano artist in the nation, according to his own bio. Lalo has been busy for over two decades chronicling the political ascendancy of Latinos in America and vigorously pushing the boundaries of Chicano art in the Post Chicano Art Era. Lalo’s most recent project is a re-boot of the famed Pocho.com, his pioneering humor, satire and cerveza webzine/blog/news site.